HomesNOW! volunteers in action. Photo courtesy of HomesNOW! taken by David Veatch. What do you do when someone asks for help with their idea that will improve the welfare of city and county residents? If the idea is sound and you have the means, you support them. Each year we support hundreds of grassroots ideas; from community gardens to veteran’s issues, from art projects to fundraising auctions. Our support is in the form of gift certificates to The RE Store, good for the purchase of recycled, reclaimed, and vintage building materials and supplies found in our 20,000 square foot facility. Part of the reason The RE Store was founded was to divert usable materials from the landfill. By donating up to $10,000 of building materials to local organizations each year, we are helping to do just that by filling the need for building materials, and changing the perception of waste. Recently a donation request came across our desks from an organization called HomesNOW! Founded by Jim Peterson and Doug Gustafson, HomesNOW! 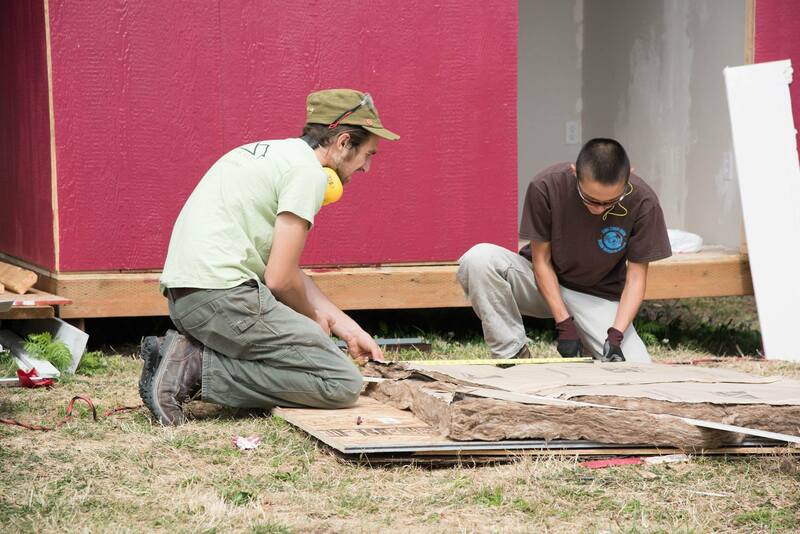 works to house homeless people of Whatcom County by building small homes available for immediate occupation. While the idea may seem too simple to work, they have provided newly constructed permanent housing for two people in the past few months. When Peterson and Gustafson first connected and discussed their goals of housing homeless people, they were confident their idea would work but didn’t yet have property to host their homes. The need was filled when they connected with Lummi Stepping Stones, a 501(c)3 that helps shelter formerly homeless Lummi Nation members and assists with mental health and chemical dependency assistance as well as employment and housing assistance. Founded in October of 2016, Lummi Stepping Stones has already helped nearly 20 people find permanent housing and employment. HomesNOW! And Lummi Stepping Stones are a natural fit. When they first connected, Lummi Stepping Stones had a need for more shelter and property to hold shelter, but they didn’t have the infrastructure. HomesNOW! had some building materials and the inside scoop on tiny home construction, but no property to build their homes. Since joining hands, HomesNOW! And Lummi Stepping Stones have housed two people in permanent, private housing and built powerful relationships that benefit many. When they started construction, HomesNOW! knew they had to keep costs down in order to make a bigger impact. Knowing that The RE Store’s cache of used building materials would be a low cost and quality option, they reached out with a donation request. However, our assistance only covers materials. If you’d like to help HomesNOW! And Lummi Stepping Stones grow their impact, visit the HomesNOW! website and Lummi Stepping Stones Facebook pages.